It was December 2011. As I walked through the snow towards the hospital I’d worked at since I was 19, a feeling of despair came over me. I heard myself say out loud: ‘I will not be doing this, this time next year.’ It took me by surprise – it was not a question, it was a fact. From that point forward I started to plan to make it happen. I was going to leave the NHS within the year. It wasn’t that I wanted to escape the NHS, but I needed to change my life. A combination of events brought me to that point – the death of my lovely dad, a relationship break up and a close relative’s ill health. At the start of 2012, the year I turned 47, I obtained a projection of my NHS pension if I were to take it out at 50. I discussed all my options with my trust’s pension adviser, who was fantastic. I was a band 7 nurse in a practice development team. 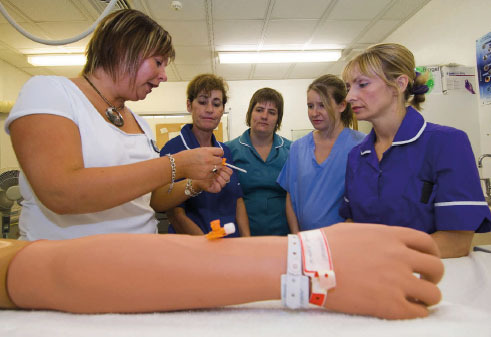 One aspect of my role was a clinical skills trainer, teaching venepuncture, cannulation, intravenous drug administration and central venous access devices care and management. I loved teaching these skills. Then it hit me – why not be a freelance trainer? I emailed independent training providers and started working as a freelance trainer a few months later. Going through my pension options, and looking at the amount of work I could get, meant that I was confident I could earn a realistic income. During this time I also moved to a new area, which made it all the more important to leave my job. Staying in the same job would have meant long hours of travel and major changes in my life. However, I felt positive and driven as I knew I could achieve a work-life balance. Contact your nearest Chamber of Commerce, which supports local businesses. Invest in a website designer who will offer ongoing support and advice. Always negotiate when buying equipment or hiring venues. Be open and honest, ask for help when needed and be yourself. Open a business bank account, keep a spreadsheet of your income and outgoings, and find a bookkeeper. Use Twitter and follow supportive accounts, such as @WeNurses and @NurseStandard. Obtain evaluations of the services you provide (as evidence for revalidation). Find a confirmer for NMC revalidation. Be polite and positive with contacts who may not use your services now, but who may come back to you or recommend you to others. I worked as a freelance trainer for three years, but early last year I decided to start my own training business. I wanted to be in control of my career and training content. I was scared, but it was fear of the unknown. The key was in the planning and preparation. When setting up the business, challenges included: how to promote my training, manage payment methods, buy equipment, dispose of sharps, build a website and ask for help. I overcame these challenges and learned from my mistakes. My advice is to stay positive, don’t let rejections or hurdles stop you and find a way round the obstacles. Positive actions attract positive happenings. I am more confident, have developed my negotiation skills, and am more able to ask for help. People’s kindness is just outstanding, so never be afraid to ask for help or advice. Be true to yourself and do not try to be something you are not. I am in control of what I do and what I wish to achieve. Above all I enjoy what I do. I meet fantastic people, teach great delegates and know I am part of safe patient care. My business is now a year old and is growing – providing training to individuals and on-site training to healthcare providers. I have developed a central venous access devices care and management course and a half-day venepuncture and cannulation update. I am so proud of myself. Although I have had dark times, I have always come through, finding a positive to take me forward. Now I am in control of what I do and what I wish to achieve.